Stats: Uptown - Bone Up Brewing Co.
Best Occasion to Drink: While you delude yourself into thinking the winter weather might "clear up" if you just stick around for one more beer. 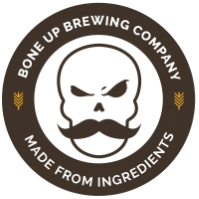 Brewers' Notes: When the fine folks over at Bonetown Burgers approached us about doing a collaboration beer, we said "heck yes!" and then set about doing what we do best (giggling and spinning around in circles until we fall over). After a modicum of hemming and a bit of hawing, we settled on doin' a big ol' oatmeal stout - it's black as night and smooth as those satin bedsheets that you bought when you were drunk because you thought they'd be comfortable but they really just get tangled up all the time. Anyway, enjoy!